Hello there Donist World denizens and welcome back. I’m joined as every by CFO Obie (my friends’ Boston terrier) and by marketing director / administrative assistant / party planner / bad-week counselor (my dog, Obie’s sister). I am running a bit behind on Donist World, and this week has been none-too-fun, so we are going to cut the intro a tad short. Usually, Obie would balk at this, but even he is feeling bad about things, so he is thankfully not giving me any grief about stuff. Hey, he even went so far as to give me one of his spare chicken tacos. Sure there was a sizable bite taken out of it, but it’s the thought that counts. Anyhow, check out these four comics, as well as the awesome hardcover that wowed us this week. 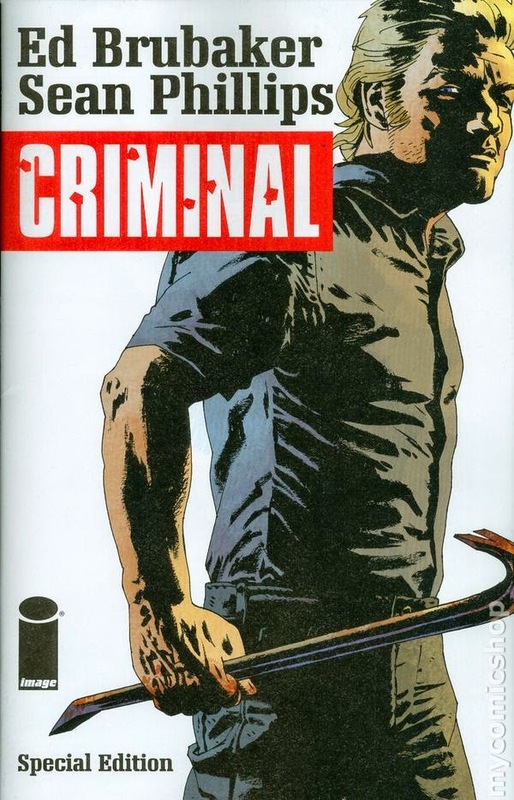 Criminal: The Special Edition (One-Shot) - Written by Ed Brubaker, illustrated by Sean Phillips, colored by Elizabeth Breitweiser, published by Image Comics. Teeg Lawless is not a good man. Not by a long shot. It’s no wonder he’s in prison, only he is doing time for a trivial crime as opposed to the the very big one the authorities don’t even know he committed. Thankfully, the sentence is short, and all Lawless has to do is keep his head down and wait out the days reading old comic magazines…that and figure out why there’s a price on his head. Holy shpamoly, denizens, this comic is fantastic. 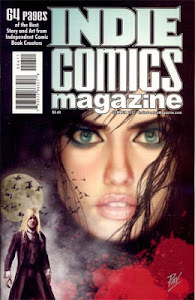 Last we saw of Brubaker and Phillips’s Criminal was back in 2011 with the four-issue mini-series Criminal: The Last of the Innocent, and if you read my FSoH/SitW posts from back then, you’ll know that I was kind of blown away by that chapter. Honestly, you can say the same about most of the Criminal books over the years, but after an over-three-year-long absence, was I was worried the series had lost some of its luster? Heck no. If you are a fan of crime comics, then there is absolutely no reason to skip out on this issue or the series in general. In each chapter, the creators take unsavory characters, criminals (duh), and provide a glimpse into who they are, what they’ve done, and for some, who they were. The brilliant part of this series is that you begin to sympathize with the various characters, even up until the point they do something truly horrible; even then you might find yourself rooting for them. The same holds true for this one-shot. Teeg Lawless is a terrible human being. He is fine with killing, thieving, and most other illicit activities, and if you have been following the various Criminal books over the years, then you already know of Teeg, as he has been around in most (possibly all) of the arcs, and even starred in an issue. You should not like this man. You’re not supposed to. Still, the creators bring you into the mystery of who put the hit on him, and you can’t turn away. In addition to the regular story, we are treated to a Warren Magazine-esque, black and white comic — with yellowed pages, no less — of Zangar the Savage, which Teeg attempts to read to pass the time despite continually being interrupted by attempts on his life. Phillips’s dark, shadowed style — prominent in books like Criminal, The Fade Out, and Sleeper — is better than ever, but in the Zangar sections he casts aside the shadows for a clean line style prevalent back in the day of the Warren Magazines I loved so much as a kid. Whether you are looking at the story proper or the comic-within-a-comic, Phillips’s artwork, regardless of the style, is simply beautiful. Buy this comic. When I sat down to read this 48-page, $4.99 book (a bargain) it was late, I was tired, and almost called it a night to go to bed. Then I peeked inside to the yellowed, black and white Zangar tale, and the next thing I knew, I was awake and completely hooked by the story. I loved it. You can read this one-shot without having read any of the material that came before it, and I encourage all Criminal newbies to do just that. But…if you have interest in reading a phenomenal crime series, then I STRONGLY recommend you pick up the trades. That said, be sure to pick up the newly re-issued Image Comics versions of the Criminal trades, versus the older Marvel Icon ones, as I believe the creators receive a larger share of the sales. Although Criminal: The Last of the Innocent is still my favorite chapter, this one-shot comes in at ridiculously close second. VERY HIGHLY RECOMMENDED! Chew #46 - Written and lettered by John Layman, illustrated and colored by Rob Guillory, color assist by Taylor Wells, published by Image Comics. Poyo in hell? Colby and Chu at odds? New and unexpected partners? A candy shop that is anything but sweet, and a plan that's kinda-all-sorts-of-messed-up? You betcha. Did you feel it, denizens? 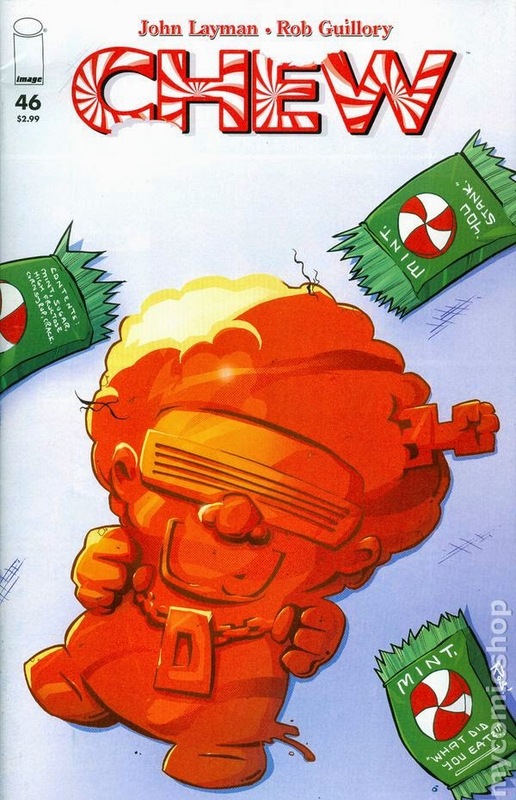 If you have been reading the ever-awesome Chew, then I’m sure you did. For those of you not reading the most unique book on the stand, allow me to explain. 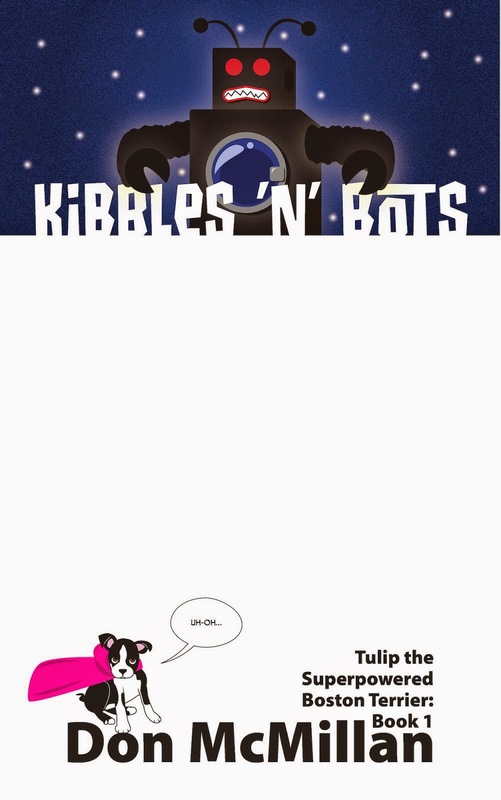 After 45 issues — and two must-read Poyo specials — Chewvotees (devoted Chew readers…duh) have become quite attached to many of the characters in the book, and although every issue contains at least one moment of laugh-out-loud hilarity and zaniness, the past couple of installments have proven to be emotional gut punches that left us all reeling. We have watched characters get brutally beaten, one eviscerated, and one major character seemingly killed by a most heinous betrayal (no way is this so!). With issue 46, we see the fallout of broken trust and strifes worsened. Still, you can’t help but laugh through much of this issue. Layman and Guillory bring back D-Bear as Tony’s new partner, and despite my still being tore up over what went down at the end of last issue (I ain’t spoiling, but I’m sure you could figure it out), I was smiling as the diminutive man with larger-than-life hair punched out the evil-doer of the issue; heh…I’m still cracking up over it. But here’s the thing about these creators: one moment you’re grinning through the exaggerated characterizations, the funny sequentials, and the brilliant colors, but the next page brings all of that to a screeching halt as we are reminded of the grim events of the past couple issues. <brrrrr> Throughout the series you are allowed to become comfortable with the insane characters and the oddball world they inhabit, but that is when the creators remind us that although this is a mostly humorous comic, there is a grand story at work that isn’t always so nice. Chew is flat out the best comic book ever created involving food-based powers. Yeah, I know, there are no other comic books involving food-based powers, but if there were, Chew would still be number one. Outside of that, this comic is consistently one of the best books on the stand. We are rapidly approaching the series end — issue 60? — which leaves me conflicted in my need to see what happens next, and my desire to see this fine book continue for infinity years. If you are not reading Chew (<sigh>, btw), and you can get past some of the gross parts (you know you can) do not just jump on anywhere. Start at the beginning. You can easily find the first nine trades, or take pride in your comic collecting / reading via the four gorgeous “Omnivore Editions”… like I have. Winner, winner, chicken dinner! HIGHLY RECOMMENDED! Low #6 - Written by Rick Remender, illustrated by Greg Tocchini, lettered by Rus Wooton, edited by Sebastian Girner, published by Image Comics. Stel Caine’s life has not been easy, yet she remains optimistic about the future. She has seen her husband killed, her daughters abducted, and her son fallen to corruption amid life in a city that is about to die. Then she receives hope in the form of a returned probe promising life beyond her dying world. She drags her son away from self-destruction to search for the probe, and in their journey, Stel finds the pirate king Roln, the man who killed her husband. She also finds one of her missing daughters, and learns that the future is not something that comes easily. I am still loving this book. I count it as my favorite of Remender’s recent creator-owned work, which is saying something given just how great Black Science and Deadly Class truly are. Low is a comic that may as well have been written for me in that we have an undersea sci-fi adventure mixed with monsters, massive cities filled with corruption amidst a world about to die, villainous villains, and a hero who remains strong in her optimism of a future despite every single horrible thing thrown her way. I wish I had Stel’s strength. The creators gave us much to admire in the Caine family from the first few pages of the first issue. They roped us in with their dreams and the closeness of their tight-knit family, and then summarily tore it all apart by the end of that same issue. 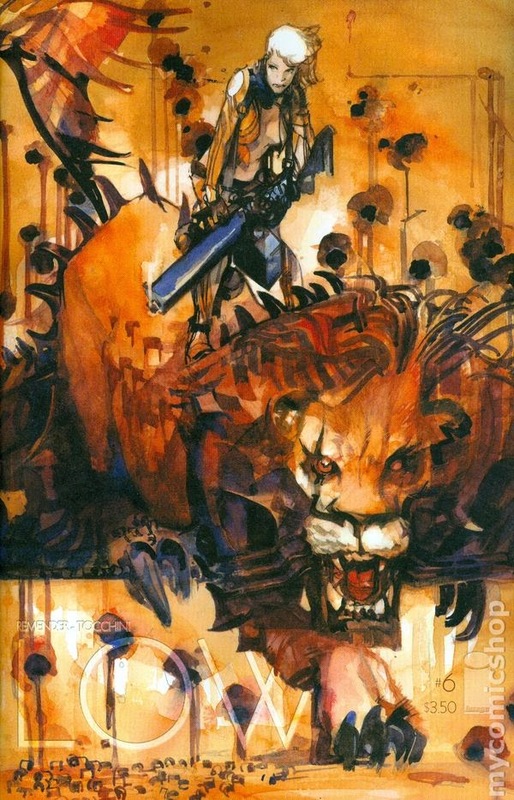 It’s a difficult thing to endear new characters to readers in but a few pages, yet Remender and Tocchini succeeded in doing so, and have since given us the highs and (more) lows that hit hard and left us admiring Stel for her perseverance. Again, I wish I had Stel’s strength. Tocchini’s art continues to be staggeringly beautiful, especially with the predominantly warm color scheme, and the character designs of Stel, Marik, Tajo, and the supernatural pirate king Roln. My only nitpick with this issue is that a handful of panels are a bit unclear as to what is happening, but that said, those panels are still gorgeous in color and composition. As I have mentioned in past reviews, I would LOVE to see many of these covers / pages / panels become posters. Thus ends the first arc, and what an ending it is. Some gnarly stuff goes down in this issue, denizens — boy howdy, does it — and I still don’t know quite what to make of what happened or what to expect for the next arc. What I do know, is that I am already anxiously waiting for the next issue of Low to return, and it’s safe to say that issue will be at the top of my reading stack come June. The first trade will be available near the beginning of April, so if you have not been reading this thrilling series, then catching up should be simple and at the top of your todo list. HIGHLY RECOMMENDED! 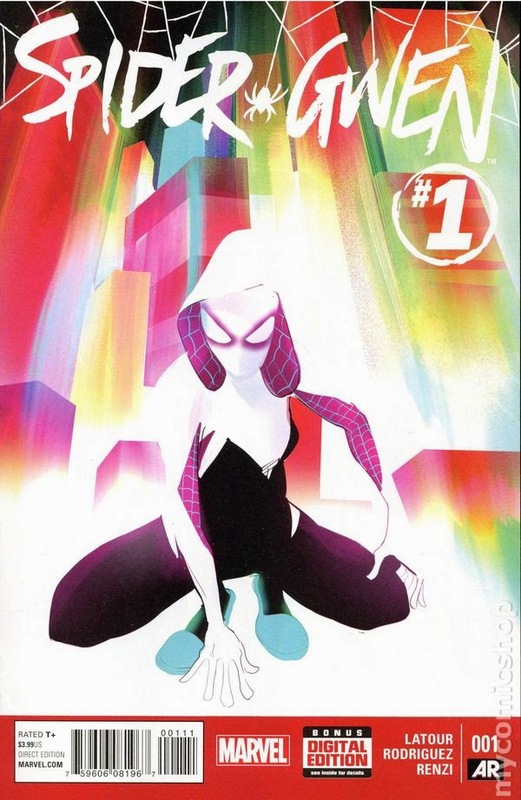 Spider-Gwen #1 - Written by Jason Latour, illustrated by Robbi Rodriguez, colored by Rico Renzi, lettered by VC’s Clayton Cowles, published by Marvel Comics. In another time, another place, another world, it was Gwen Stacy, not Peter Parker, who was bitten by a radioactive spider that left her with sensational powers and abilities. Now, she is known as Spider-woman, and villains best beware. But that is her secret life…in the real world she is the daughter of police captain George Stacy, and she just recently quit the hit band known as The Mary Janes. Okay, full disclosure here: I have not bought or read a Spider-Man book in I don’t know how many years. It has seriously been a long time, denizens, but please know that I’m not saying I don’t care about the character, I do, it’s just that I dropped off decades ago and never came back. That said, I am curious about what went down in Superior Spider-Man, and I’m unsure of the Spider-Verse event, but I know this Spider-Gwen character had a bit of buzz, not to mention one heck of a groovy character design. So, why not give this #1 a shot? The one-page intro sheet explained some of what happened in the Spider-Verse thing, but honestly I was a bit confused as to what is up with Matt Murdock and the grey-skinned, goatee, Hulky dude, but whatever…I just went with it. Anyhow, having zero experience with this character or the world, it quickly became clear that this is a different universe as we meet a very different Ben Grimm, and a familiar Frank Castle working what has to be the man’s dream job. The Vulture quickly appears on the scene and the story kicks off from there. Latour does a fantastic job giving all of the characters their own voices and the dialogue and situations made the F-word come to mind…the “F-word” being fun. This is further aided by Rodriguez’s solid storytelling skills and tight line work, with Renzi’s bright, close-to-flats color schemes creating a style that looks to make this title more accessible to new readers, which is great. Again, Spider-Woman’s design is just plain cool. Like I said, I’m not completely certain what the heck is going on, but this issue captured my interest, and made me curious to see what happens next issue. I want to learn more about Gwen, The Mary Janes, and this new parallel universe. The crazy thing is that Spider-Gwen also got me buying a Marvel superhero book once again, one that wasn’t the soon-to-end Hawkeye. This issue is definitely worth checking out and had I read Edge of Spider-Verse #2 (where Spider-Gwen is introduced) prior to this one, I would have probably liked this issue even more — looks like I need to track down a copy of Edge of Spider-Verse #2. RECOMMENDED! 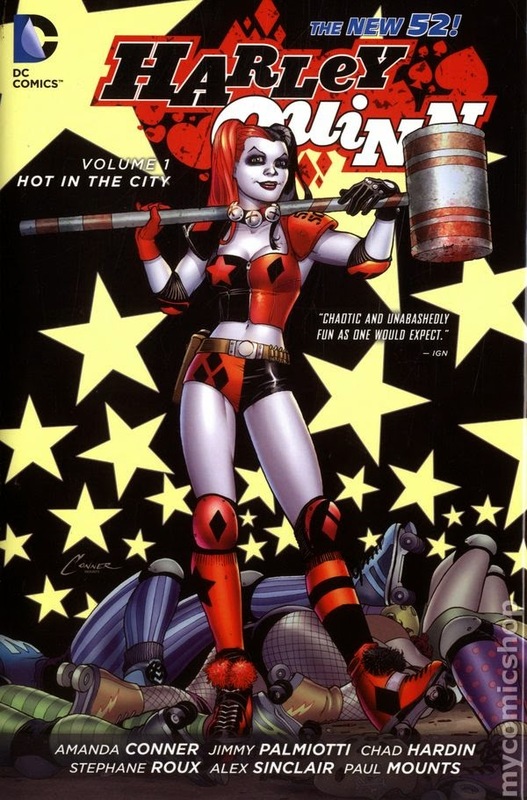 Harley Quinn: Hot in the City HC - Written by Amanda Conner and Jimmy Palmiotti, art (mostly) by Chad Hardin, colored (mostly) by Alex Sinclair, lettered by John J. Hill, published by DC Comics. Harley Quinn is back and on her own in Brooklyn after inheriting an apartment building along with its colorful cast of occupants. Unfortunately, the property taxes that go along with the building require a hefty sum of green, something Harley is sorely lacking. So, with the help of a part-time therapy job, a roller derby job, and various…legally questionable jobs, Harley's looks to make life work. But when someone mysteriously puts a hit on her, sending every second-rate assassin out to kill her, Harley luckily has her apartment building friends, Poison Ivy, a stuffed beaver named Bernie (don’t ask), and a really, really, really old cybernetic guy to lend a helping hand. I’ve been cool with Harley since the phenomenal Batman: The Animated Series first aired, but have not kept up with her in the comics at all. Sure, I’ve seen hundreds of people dressed as Harley at the various cons, and have heard / read about the various changes with the character and the myriad teams she has been involved with, but I just haven’t cared enough to delve into the Harleymania. Thanks to podcaster Jason Wood’s very high praise for this book on the 11 O’Clock Comics Podcast (my favorite podcast, btw), I decided to give this book a shot. I am so glad I did. As of this writing, Amazon.com (click the image or the link) is selling this beautiful hardcover for $12.49. This is for nine issues (0–8) of the New 52 Harley Quinn series, which also includes uncolored Amanda Conner cover art, a bunch of penciled art from the series, and all of the alternate covers. For little more than a dollar an issue, you can’t beat this deal. As for the book itself, it is charming, zany, and funny-as-all-get-out. I was immediately pulled into the crazy story and the mentally-unbalanced, animal-loving Harley had me seeing hearts every time she pulverized a bad guy with her immense mallet. I have no idea why an inanimate, partially-scorched, taxidermied beaver named Bernie is her best friend, but who am I to question a psychopath? Poison Ivy is great, the roller derby moments fun, and the fast-pace of the story kept me whipping through the pages. Hardin’s character designs are stunning and his storytelling fantastic, while Sinclair’s vibrant colors keep the vibe disarmingly light, even when Harley flat out murders some dudes. What I love the most about the art, though, is the expressiveness of Hardin’s characters, namely with Miss Quinn. This is a beautiful book in story, art, and overall design. You need to buy this. It’s practically a steal at this price, and I’m sure the deal at Amazon.com won’t last for much longer. 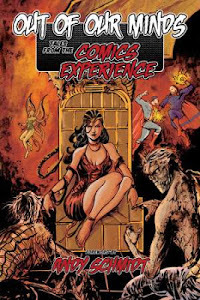 The funny thing is just as Swamp Thing, the only DC book I’m buying, is poised to end, I’m brought back into the fold with this demented, fun-filled book that I hammered through over a couple days. It’s great to see some fun come back to the Big Two, and I now can’t wait for the next hardcover to come out. I never would have thought I’d be reading and loving a Harley Quinn book…huh, imagine that. VERY HIGHLY RECOMMENDED!